Abstract: The research question in this report is whether a higher proportion of female farmers increases food sovereignty in developing countries. We created an index to measure food sovereignty using proxies for the following indicators: food quality (nutrition), food security, and local production of food. We gathered our data from the Quality of Governance dataset, UN Food and Agriculture Organization statistics (FAOSTAT) dataset, and the United States Department of Agriculture (USDA) Economic Research Service Global Food Assessment (GFA). We used the between effects method to determine the effect that the percentage of female farmers has on food sovereignty. 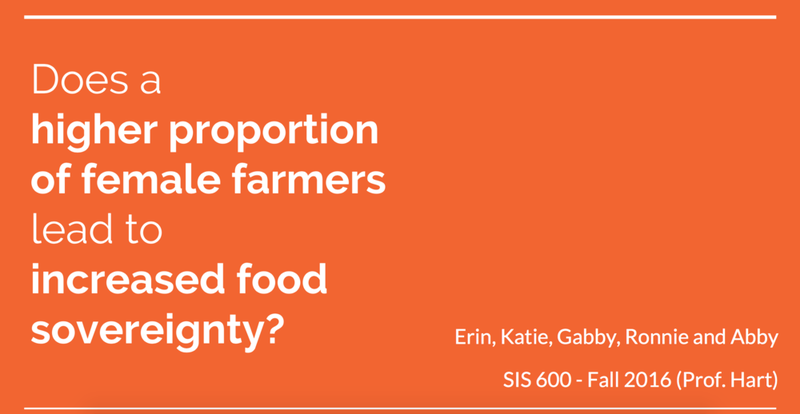 In conclusion, we found that, based on available data, the effect of the percentage of female farmers on food sovereignty in developing countries is not statistically significant. Our hypothesis is that an increase in the percentage of farmers that are female will lead to an increase in food sovereignty in developing countries. The main argument is that since women tend to be the primary producers of food crops, a higher percentage of female farmers in a particular country would lead to greater food sovereignty.